For 50 years, Kannur in Kerala has been driven by the 'eye for eye' motto and violence has largely played out between Left and Right. The result: More than 250 political killings. Kannur: Cries for peace rent the air in Kannur, long identified as the killing fields of Kerala for its history of political violence, as parties parade the victims’ photographs on the campaign trail this election season. 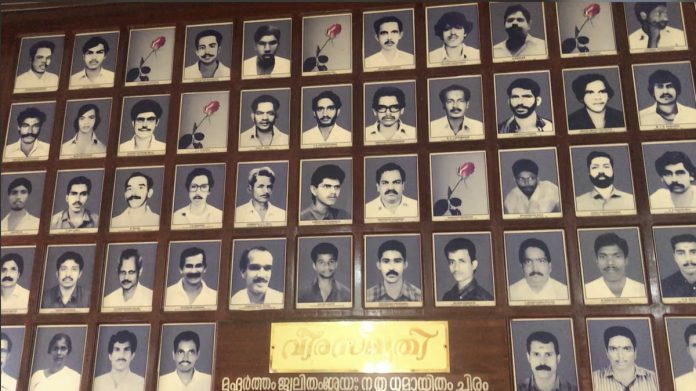 For 50 years, politics in Kannur has been driven by the motto “an eye for an eye”, culminating in over 250 political murders of workers representing either side of the ideological divide. But having lost many a loved one, locals are now desperate to move on from this legacy, and their leaders have taken note. Photographs of the victims are ubiquitous on the campaign trail in the state, what with political parties looking to tap the local disenchantment with violence and bloodshed, as well as the deep sense of loss, ahead of the Lok Sabha election. All of Kerala’s 20 Lok Sabha seats will vote the same day, on 23 April. “Our men have been martyred and their blood will not go in vain. We should fight to stop this bloodshed,” said a young CPI(M) supporter in Elayavalli when ThePrint asked him what he thought was the main political issue in Kannur this election. Attending a rally of CPI(M) candidate P.K. Sreemathi, who has hit the campaign trail with appeals rooted in the development brought by the state’s Left Democratic Front (LDF) government, Pramod said the narrative was changing in Kannur. Kannur largely comprises people belonging to the Thiyya (OBC) community and Muslims, important vote-banks for both the Left and the BJP, the political front of the Rashtriya Swayamsevak Sangh (RSS). There have been casualties of other hues too, but the violence in Kannur has largely played out between the Left and the Right, the CPI(M) and the RSS. While the clashes took place even before 1969, the hostilities are believed to have taken a turn for the worse after the killing of RSS leader Vadikkal Ramakrishnan that year. Political experts trace the bloody nature of political conflict in Kannur to the fact that the district has been a socially- and economically-backward region with a penchant for arts that focus on physical fitness and strength: Theyyam, Kalaripayattu, Angam, Kudipaga. Kannur is part of the Malabar region, which historically saw several radical movements against feudalism, and experts say it’s in the local DNA, the readiness to die for their political parties. People in Kannur shed blood with pride, said political researcher and analyst T. Sasidharan, who has authored the book Radical Politics of Kannur. Mohammed, whose 27-year-old son Shuhaib, a Youth Congress leader, was killed in February 2018 in Mattanur by suspected CPI(M) workers, is ambivalent about the use of his photos in the election campaign. Twenty kilometres away from Mattanur, in the village of Pinarayi, Narayani, who is in her 60s, sits alone on a cane chair at her house, watching the campaign vehicles of CPI(M) pass by announcing the party’s promise of progress and stability. Tears roll down her cheeks as she talks about her husband, Chavaserry Uthaman, an RSS-BJP worker allegedly killed by CPI(M) workers in 2002. Her husband isn’t the only one she lost. In 2016, her son Remith, 28, was killed too, in an attack she claims was carried out by a group of CPI(M) workers. Remith is believed to have been killed to avenge the death of a local CPI(M) branch secretary Mohanan, who was hacked to death at his toddy shop in village Paduvilayil, a few kilometres away from Pinarayi. “Six men came wearing masks and they entered the shop and hacked him to death,” said Mithun, Mohanan’s son. Mohanan was known to have been an extremely compassionate and helpful man. Leaders of the BJP-RSS and the CPI(M) acknowledge the change in attitude among cadres, and their weariness with violence. “A lot of innocent people have been killed from our party,” said T. Anil, a local CPI(M) area committee member in Pinarayi. “This election, we have been telling people we will give those who have lost their loved ones justice. We are trying to stop [the violence], and have been, in a big way, sensitising our cadres against resorting to violence,” he added. “If you listen to what the RSS leaders have been saying, they too are hoping to curb the violence,” he said. Even so, there is an evident effort to invoke this weariness with violence to score a point over rivals. M.P. Sumesh, the BJP mandala president in Thallassery, said people of Kannur should use the ballot to register their protest against political killings, taking a potshot at the CPI(M). “The CPI(M) has been… using their politburo, state secretaries and zilla secretaries and other officials to fuel passions,” he added. “In Kannur, people should use the ballot to create a change and tell the other side that they will not accept another drop of blood on Kannur soil,” added Sumesh, a survivor of a suspected political attack. In 2008, a seven-member gang had assaulted him, inflicting deep wounds on his head and face and cutting off his left hand. K. Sudhakaran, the candidate of the Congress-led United Democratic Front (UDF) from Kannur, said people were fed up with the killings, before taking on a partisan tone. “People are hoping for a verdict against the CPI(M)’s murder politics,” he said. Political researcher and analyst Sasidharan said political parties were milking the deaths of workers to gain votes in Kannur. “It is sad… The main reason for these murders is the lack of political knowledge. Most of these party workers are not well-educated and the political leadership is using them for their own vendetta agenda,” he added.